Let’s hear it for Washington cold storage — the state, that is. Cold storage capacity in Washington state increased by a mammoth 28 percent in a recent two-year period and catapulted Washington from No. 7 to No. 2 in the nation, behind only California, according to the biennial Capacity of Refrigerated Warehouses report released by the U.S. Department of Agriculture earlier this year. The January 2018 report noted a nationwide decline in cold storage capacity of 13.6 percent over the two-year period. But among states with the most capacity, a shift toward western ports and growers appeared to be evident. Washington state’s gross cold storage capacity increased 28.4 percent to 271.3 million cubic feet in October 2017. This was up from 211.2 million cubic feet in October 2015, as reported by the Agriculture Department’s National Agricultural Statistics Service. This was by far the biggest gain in any state that made the Top 10 two years earlier. Other gainers included Oregon (up 3.9 percent) and Wisconsin (up 2.9 percent), which moved both states up one position in the Top 10. California remained the top state for cold storage capacity, despite seeing 30.4 percent of its capacity disappear in two years, losing 173.5 million cubic feet of cold storage capacity since the previous report came out. All other Top 10 states lost capacity, as the states within the Top 10 remained unchanged from two years before. 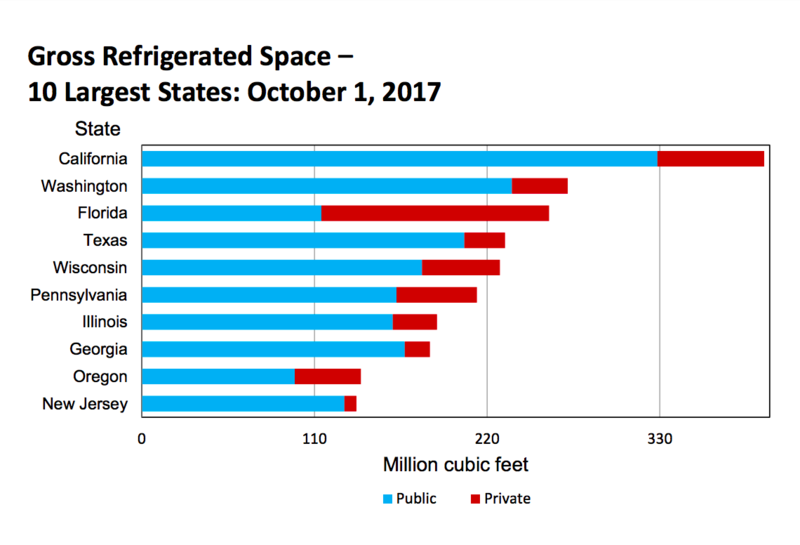 New York and Georgia lost the highest percentage of capacity for any state with at least 100 million cubic feet of cold storage in the 2016 report, dropping 34.7 percent and 26.7 percent respectively in this year’s update. Washington’s big gains caused it to pass up likes of Florida, Texas, Georgia, Pennsylvania and Wisconsin this year in moving from No. 7 to No. 2.